Ukrainian Prime Minister Volodymyr Groysman intends to create a working group jointly with business to draw up a bill toughening responsibility of representatives of law enforcement agencies for harassment of business in two or three weeks. "I am initiating today with you, together, the creation of a working group - very fast - to introduce in two or three weeks a bill to the parliament that provides the responsibility of representatives of law enforcement and controlling agencies, right up to the criminal punishment, for excessive pressure on the really working business," the prime minister said at a roundtable in Kyiv on Monday. 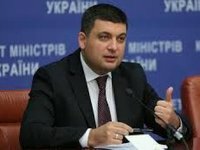 Groysman urged businesses to participate in drawing up the bill. "I have a question: why are "corrupt officials in uniform" still not brought to justice? Those who press or create excessive pressure on a really working honest business in the country? It is very important that we resolve this not with words and promises, but with concrete legal actions," the prime minister said. He also said that within 7-10 days the profile committee of the Verkhovna Rada should submit a bill on the Financial Intelligence Service (FIS) to the Cabinet of Ministers of Ukraine.